During the next two weeks, I will be spending some well needed time with my family and will not be writing as much, so I’ll be running some of my most read posts, starting with…15 Tips For Flying with Lap Infants. Don’t worry though Stroller Runners, I will continue to update the stroller friendly race calendar on a daily basis. Flying with kids of any age can be very stressful, but flying with kids under the age of two seems like you are embarking on an epic journey. It does not have to be that way. I am no expert in baby/toddler travel, but I have driven several thousands of miles with my son and flown more than 8 times with a “fly free” or lap infant in the past 20 months, so I feel I might be able to provide some useful guidance and tips on traveling with a toddler. With the holiday season coming up and families are considering traveling to see friends and relatives; I thought this would be an appropriate topic to broach. Here are my top 15 Tips For Flying with Lap Infants for parents with lap infant or “fly free” kids (children under the age of 2 years old) to make you and your baby have a more relaxing trip. 1. Fly when your child seems to be the most relaxed. This might require trial and error. Some parents say flying the red eye is best, or flying during nap times. I have flown during my toddlers nap time; did not work because he was too excited. I have flown a red eye (night time, think that would work); nope he was up the entire flight. The best time we found to make it the most pleasant flight for everyone was the earliest flight in the morning. Of course this was a bit harder on my husband and I (especially since he sat on my lap), but it seemed to be the best for our toddler. 2. Check airlines regulations for lap infants. Yes, most airlines allow lap infants to fly free under the age of 2, but some require physical boarding passes for the infants and some do not. For instance, if you fly United Airlines, they require a physical boarding pass for an infant; whereas Frontier Airlines does not. This is essential if you are trying to check in prior to arriving at the airport. Also, I recently discovered that on American Airlines, you can’t book an infant lap ticket online; you have to call their reservation line. Every time we have flown with our toddler on United Airlines, we physically have to go to the counter with assistance because they have to print a boarding pass for us. The machines will not print the boarding pass for the infant because the infant did not have a paid seat. Also note, United Airlines is no longer allowing you to preboard with children. 3. Try to reserve a window seat if possible. Other might disagree, but I think the window seat for you flying with a lap child is the best. My son likes to look outside and I can move forward during the flight and he can sit in the seat and stretch his legs or sit on the arm rest near the window for a few minutes at a time. 4. Ample drink/food of choose. Depending on your child’s age, ensure you have whole milk, formula or breast milk – if you are still breastfeeding – for your baby and/or toddler. And feed then when the plane is taking off and landing. In my previous post on 15 Tips For Flying with Lap Infants in November 2011, I mentioned sucking helps reduce ear popping, but sense then, I have learned that is a misconception. I would bring a bottle or drink more for comfort now. If you are traveling with formula, I would recommend the powder type because it doesn’t require any special security inspection. If you are traveling with breast milk and want to ensure to avoid any hassle, I would recommend printing the TSA breast milk allowances prior to leaving for the airport. Therefore, if for some reason a TSA agent hassles you, you can present them with the required breast milk allowances. Notify the TSA agent prior to going through the screening. I have encountered some TSA agents that want to test your breast milk with a strip and some that do not. Do not be concerned this strip will not contaminate your breast milk. If you need whole milk, you will need to purchase it after getting through the security check and do not wait to get it on the plane. Generally, I have found most airlines only have 1% or 2% milk on the planes. I found out the hard way that low fat milk upsets my 20 mos. old stomach. You can purchase whole milk at Starbucks prior to getting on the plane. Ask the Starbucks attendants for a cup of whole milk; they will probably charge you about a $1 and provide 12 oz. of milk. It is the only place that I have found in airports that sell whole milk, except for Terminal A at Reagan National Airport in Washington, DC. 5. Carry non-sugary snacks. I have heard from several parents that they bring “treats” – with sugar -on the planes that their children normally do not get to help persuade them to behave. Keep in mind this can back fire. The first time I flew with my son, I did just that. I brought a “treat” that he normally did not get. He was great while he was eating it, but after the sugar kicked in he was bouncing off the walls. Now, I just carry several snack packs of his favorite “normal” snacks such as mine new favorite FruitaBu Organic Smooshed Fruit, Earth’s Best Elmo Crackers, mini wheat pretzel sticks, and Chex cereal. Try to take into consideration the snacks you are packing should be finger foods that are relatively “non messy”. 6. Bring extra change of clothes. Perhaps it is the excitement, or the stress your child feels from you, but I think flying encourage major blowouts. The blowouts happen at the most inopportune time. On a recent flight, right as the plane started to back out of runway, my son gave everyone a surprise. Yes, huge and smelly. Several times I had to change him on a flight because he peed through his diaper, which never happens any other time, and I was not about to let him sit on my lap with wet clothes. 7. Bring more diapers and wipes than you anticipate. Consider bringing more diapers and wipes than you would normally carry. If the plane is delayed or your flight last longer than expected, then you are always prepared. I generally bring 4 diapers in my diaper bag. 1 diaper is used prior to boarding the plane, 2 for the plane, especially if the flight is longer than 3 hours, and 1 for after the flight to change at the terminal. In regards to wipes, I would consider carry a new travel package of wipes or bring a large Ziplock bag with a handful of wipes from your bulk wipes at home (this is the cheaper option). I use wipes not only for the bottoms, but to wipe the window, arm rails, dirty fingers and mouths. My son likes to put his mouth on everything and planes and airports are carriers of so many germs. 8. Layer, Layer, Layer. Dress yourself and your toddler properly for the trip with several layers. As you know, depending on how well the airflow on the plane is, you can get extremely cold or extremely hot. My toddler sits on my lap, so his body heat and mine transfer to one another; therefore making us hotter than normal. Also, when my son pees in his diaper, I can feel it get warmer on my lap. You know like when you peed in a pool as a kid how it got warmer in the water around you. Don’t pretend you never did it. 9. Change your baby’s diaper prior to boarding. If possible, try to change your baby’s or toddler’s diaper prior to boarding the plane. I would recommend about 10 minutes before they announce parents with young children. The reason being is your plane could be sitting in line on the runway to take off for up to an hour or long (hope this is not the case) and your required to remain buckled. This leads to a predicament when you need to change your baby’s diaper. This will allow you some time before needing to interrupt your seat mates to get up and change your child’s diaper. 10. Bring a stroller regardless if you are wearing your baby or your toddler is too heavy. Strollers can be invaluable, especially when carry babies, bags and drinks. At some large airports like Chicago’s O’Hare airport the walk can take up to 20 minutes to get to security to your gate. 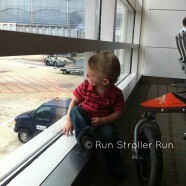 Since November 2011 to now, most airlines will no longer allow you to gate check a jog stroller such as the BOB Revolution. For complete updated on United States Domestic Airlines stroller regulations, check out our post on Flying the Stroller Friendly Skies. In order to not mitigate any potential problems, I recommend that you check the airlines website and verify that you can take a stroller (specific type) and print out the information to provide to the airline agents; therefore, you are not stuck trying to comply with a rule that does not exist. When checking your stroller. You’ll receive a tag with a tear off claim check. Then when you walk down the jet way, just before boarding, fold your stroller and leave it to the side. When you get to your destination, it will be waiting for you just as you deplane. 11. Walk the aisles a lot. This might seem counter intuitive to my suggestion about sitting near the window, but I have found most people have no problem getting up and down to let me through. I spend about an hour altogether walking the aisle with my son for flights longer than 4 hours. He seems to make friends along the way, so we stop by and say hi. I am conscious that not everyone wants a baby stopping to say hello, so I make sure I ask them prior to my sons next visit if they would not mind if he comes by again. Most of the time most people say sure. 12. Ensure items can fit in the seat pocket in front of you or the floor. Due to limited space and juggling and lap infant, you want to ensure you have everything with arms reach. Try to put the essentials such as a diaper, books, snacks, toys, bottle with you, so you do not have to maneuver and fiddle with luggage in the overhead compartments. This has only proven to be a hassles, especially now with the entire carry on luggage being jammed into the overhead compartments. 13. Bring 1 or 2 of your child’s favorite books. I would not bring too many books on the plane because you have limited space. If your child is anything like mine, we could read the same book 20 times and he still would want more. I would also consider bringing a coloring book and a small pack of crayons. 14. 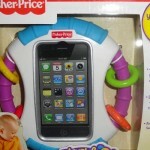 Consider purchasing the Fisher-Price Laugh and Learn Apptivity iPhone Case. 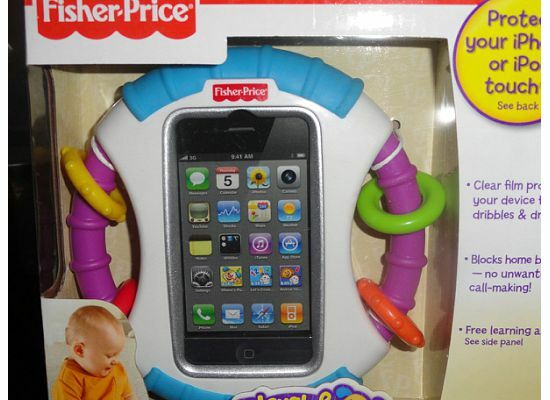 If you have an iPhone or iPod, it is great and toddler proof. Oh, and it is only $15. I do have a toddler DVD player, but I find since I’ve had the iPhone case it is easier and less cumbersome than the DVD player. Here is my review of the case if you are interested . 15. Breathe! This is the most important tip, but in my opinion the hardest to do. From experience, my husband has to remind me often to breathe and try to remain calm. Remember, once you get to the airport, there is only so much you can do. Try to relax and enjoy the trip as much as possible. If it is your first time flying with your child, take picture and capture this “first” moment. My son loves to fly and can’t wait to see the planes and go “up” and it is such a special moment for me to share with him. Good luck with your travels and hopefully, these top 15 tips will make for a more relaxing trip. Stay tune for more additional traveling tips with and infant and/or toddler and what airlines are best to fly with kids. P.S. Don’t forget your babies favorite stuffed animal, pacifier and/or blanket. My husband and I love to travel and anticipate doing it a lot with our little one. I have been a little apprehensive about flying with her, but I will definitely be referring to these tips again before we embark on our first trip! I am glad you find the tips helpful. I will be flying soon with a two toddlers soon, so I am sure I will have another post with more tips. It should be fun.